Set in colonial Mexico, Angelo the Naughty One is the story of a young Indian campesino who lives in a beautiful city with lots of water; and lots of water means everybody gets to bathe. But Angelo will do anything to avoid bathing, including running away from home. This presents a serious problem for his family and apparently, for everyone else. Angelo is afraid of water because he hates baths. Yes, really. He doesn’t hate baths because he’s afraid of water, which would be an anxiety disorder that, today, is known as “aquaphobia.” Angelo’s fear of water, though, because he hates baths makes no sense in any way. But rather than seeking out a traditional doctor to work with this kid, his parents and the townspeople just refer to Angelo as “The Naughty One.” Major bad parenting, not to mention public ostracism. Yet Angelo, for no apparent reason, loves soldiers; in fact, he wants to be a soldier, and soldiers bathe regularly. At least in this story; the historical reality is way different: In places where there was water, Indians traditionally bathed regularly; soldiers and other settlers, on the other hand, did not. But let’s proceed. Angelo wanders into camp, a group of soldiers catches him, and, after having scrubbed him and dressed him in clean, second-hand clothes, the “handsome soldier,” who is about to marry Angelo’s sister, announces: “After the wedding, [Angelo] will be younger brother to a soldier and I am sure he will be proud and happy to take baths so that he won’t disgrace the army.” Having been scrubbed clean and dressed, Angelo’s whole personality changes: His fear of bathing and fear of water miraculously disappear, he attends his sister’s wedding, and Angelo now becomes known variously as “Angelo the Pride of the Family” and “Angelo the Brave One.” Not because he’s done anything heroic or especially wonderful, but because he’s no longer afraid of water. Politi’s tempera art, on a drab palette of red, green, and white—the Mexican colors—complements the story. On the cover, four smiling, impeccably neat colonial soldiers surround our young, dirty and embarrassed campesino. The soldier with the largest smile points at him in gentle admonishment, and the boy is looking up at him. Behind them is an arch; on its flagpole flies the Mexican flag. On the frontispiece, Angelo’s frowning mother, with hand on hip, is berating the filthy little boy, who is a lot dirtier than he is on the cover. He’s crying. Let's deconstruct this story. Angelo and his family are Indigenous people of the place known as Mexico. The colonial soldiers are Spanish. Here, in Angelo and the handsome soldier, we have a trope of “dirty Indians” or “dirty Mexicans” who have to be “cleaned up” by white agents of colonialism. By perpetuating the myth that all Mexican Indian families not only accepted colonialism but, in fact, were eager to move up the social ladder by marrying colonial soldiers, this colonialist Anglo-centric story disparages the heritage of all Mestizo families, then and now. 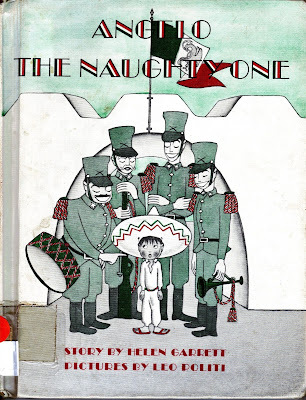 Needless to say (but I’ll say it anyway), Angelo the Naughty One should never have seen publication and is still way not recommended.